L-carnitine is an amino acid that the Linus Pauling Institute states most individuals can metabolize or obtain from foods. 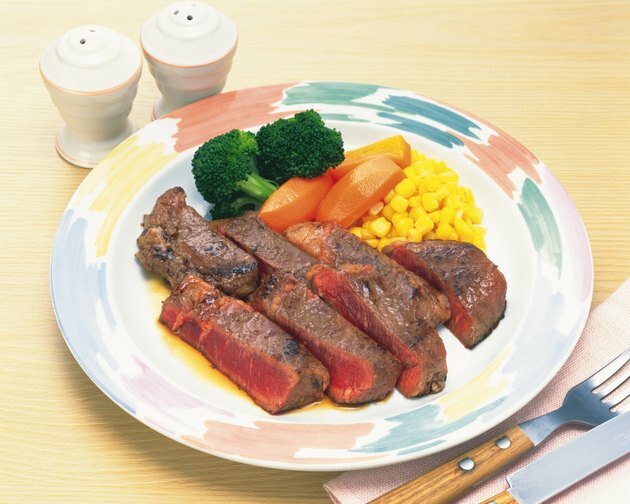 Red meats have higher amounts than vegetables. Peanut butter and avacodos are also good sources of L-carnitine. In a typical person, 86 percent of the available L-carnitine in red meats is absorbed, 72 percent from vegetables is absorbed and 18 percent from supplements is absorbed. L-carnitine fumarate use may require a doctor's supervision, although using it for enhancing athletic performance appears to be safe. Discuss all supplement with your physician to avoid possibly harmful interactions. L-carnitine facilitates the oxidation of glucose, which may allow the body to use it more effectively. The University of Maryland Medical Center maintains that very little evidence exists to show that L-carnitine assists with weight loss, yet some studies indicate L-carnitine supplements may decrease fat mass, reduce fatigue and increase muscle mass, thus promoting decreased weight. The Linus Pauling Institute explains that although in theory L-carnitine supplementation should increase athletic performance, studies to date have failed to verify that conclusion. The University of Maryland Medical Center cites several studies that show L-carnitine may be effective, in conjunction with conventional treatment, in reducing and stabilizing angina attacks. Taking L-carnitine after a heart attack may also reduce the risk of future attacks, although further study is required. L-carnitine appears promising in assisting individuals with heart failure by reducing symptoms and increasing the ability to exercise. If taking L-carnitine in relation to a cardiovascular issue, or any health concern, a doctor's supervision is recommended. Some clinical trials mentioned by the Linus Pauling Institute suggest that cognitive decline in people with Alzheimer's disease may be slowed by L-carnitine. The University of Maryland Medical Center notes that supplementation with L-carnitine may help relieve the depression that accompanies dementia and senility and may decrease fatique. It may also improve memory as you age. The website adds that study results are still inconclusive, however. What Is Acetyl-L Carnitine HCL?